your call as soon as possible. I am delighted to be your child's Art teacher! I look forward to teaching Art at Eisenhower Elementary School this year! Before teaching, I attended Montclair State University. During that time, I was lucky enough to study abroad at two Art schools, one in France and the other in England! Every child at Eisenhower School will have Art once a week. During our first few classes we will discuss the Art room rules and procedures and each student will get an assigned seat at one of the six Art tables. Every student will make a portfolio (an Art folder). 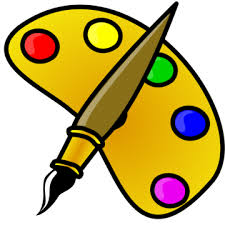 At the end of the school year, your child will bring home all of their Art projects in their portfolio. Sometimes the students like to put on an Art show of their very own at home. This is a wonderful way to display all of their masterpieces that they created during the year for friends and family! Throughout the year, we will be using many different Art materials. Students are always asked to use the Art supplies with care. Some of our wonderful supplies are crayons (various types- regular, glitter, construction paper, flourescent), markers (thick and thin), colored pencils, watercolor paints, tempera paints, dot paint, stencils and many other crreative things which I will introduce to your children. I'm looking forward to a great year!